If you’re looking for a new and challenging past time then Diving Chess might be for you. 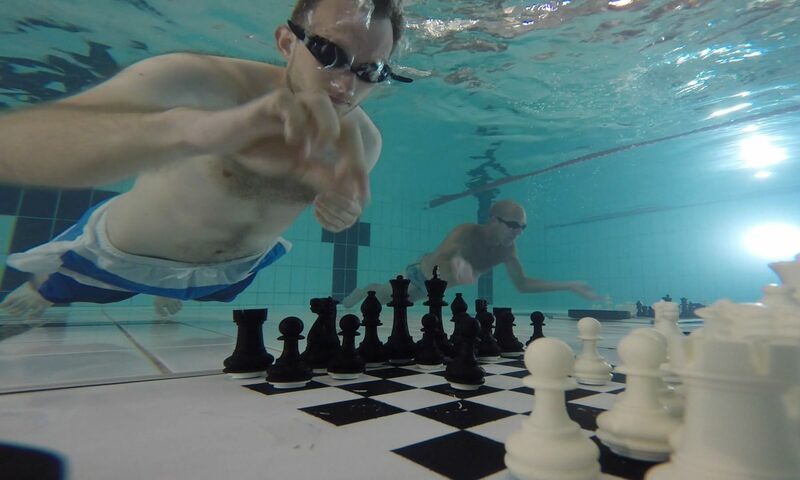 Diving Chess is like normal chess but played in a swimming pool with a submerged, weighted and magnetised chessboard and pieces. Each player can only think as long as they are able to hold their breath. Once they’ve made a move they can come up for air, then their opponent must dive and cannot come back up until they’ve played a move, else forfeit the game. Diving really changes the game strategy. Sometimes, you’ll want to play moves really fast so that your opponent doesn’t have an opportunity to catch their breath. Q: How did you come up with the concept of chess played underwater? A: There has been a longstanding argument as to whether chess is an art, science or sport. I wanted to create a variant that is definitely a sport. I had seen boxing chess matches in London–yes that’s a real thing–which involve alternating between boxing for 2 minutes per round and then playing 20 chess moves. A player can win either by knock out or checkmate. Boxing chess was entertaining but didn’t seem fair. A strong boxer could be trained to protect their king and delay checkmate and win in the boxing ring. Diving Chess was a way to add a physical element while maintaining the purity and beauty of chess. 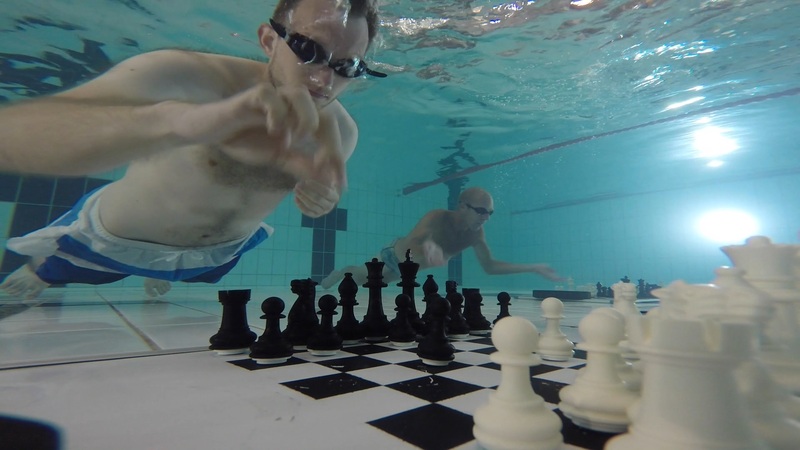 Unlike boxing chess, diving chess enables different body types and weights to compete together. Q: When developing this idea, what sort of audience were you hoping to attract? Q: How is the game affected by the limited time diving allows? A: You have to play relatively fast, so it makes sense to train by playing speed chess. Also, when preparing a sequential tactical trap, it can be useful to play quickly for several moves so that the opponent doesn’t have a chance to capture their breath. You’re alternating between trying to catch your breath and keep your opponent off balance. Q: Are there any adaptations to the typical rules of chess? A: The rules remain the same, and you still need to win by playing a better chess game. Q: How does the added stress of being underwater play into the game itself? A: It’s physically challenging. A single came usually takes at least half an hour and it gets quite cold since you’re not swimming actively–just diving up and down. During the world championships, each player competes in six matches. In order to warm up between games, we head to a sauna and then swim before each game to warm up. Wetsuits can also help and some players use weights to stay near the submerged board more easily whereas others are purists. Q: Did you face many technical challenges when developing this game? A: Designing the board took a few attempts until we finally perfected a weighted and magnetic chess set that was easy to use underwater. Q: How do the board and pieces stay together while underwater? A: It can be played at any type of water body. The deeper, the more difficult it is. The world championships take place in a shallow pool that has a depth of about 1.6 meters so that players can stand and catch their breath between moves. A WordPress Commenter on What is it?